Te Rūnanga o Ngāi Tahu (Te Rūnanga), the tribal council, was established by the Te Rūnanga o Ngāi Tahu Act 1996 to be the tribal servant, protecting and advancing the collective interests of the iwi. Mō tātou, ā, mō kā uri ā muri ake nei – for us and our children after us. The design of Te Rūnanga embraces our cultural traditions. It incorporates the best corporate governance models we could find in the world and draws from the democratic structures of local government and Western best practice. Te Rūnanga board members are appointed following a democratic process and are responsible for the governance of tribal assets and investments in tribal development. The initial asset base of Te Rūnanga was largely derived from the assets of the Ngāi Tahu Māori Trust Board and from the settlement of Te Kerēme – The Ngāi Tahu Claim (claims against the Crown for various breaches of the Treaty of Waitangi). The financial settlement amounted to $170m plus some interest and commercial opportunities and was received in late 1998. It also subsequently involved fisheries and aquaculture assets valued at $71m. Since the time of settlement the asset base has grown from approximately $10m in 1996 to over $658m as at June 2012. Over that time Te Rūnanga has made distributions and invested over $254m in tribal development, much of that being direct to our Papatipu Rūnanga and tribal members through a matched savings programme, education scholarships and grants and the like. One of the principles of our Charter is that the assets of Ngāi Tahu must be managed separately from the bodies that spend and distribute the income earned from those assets. 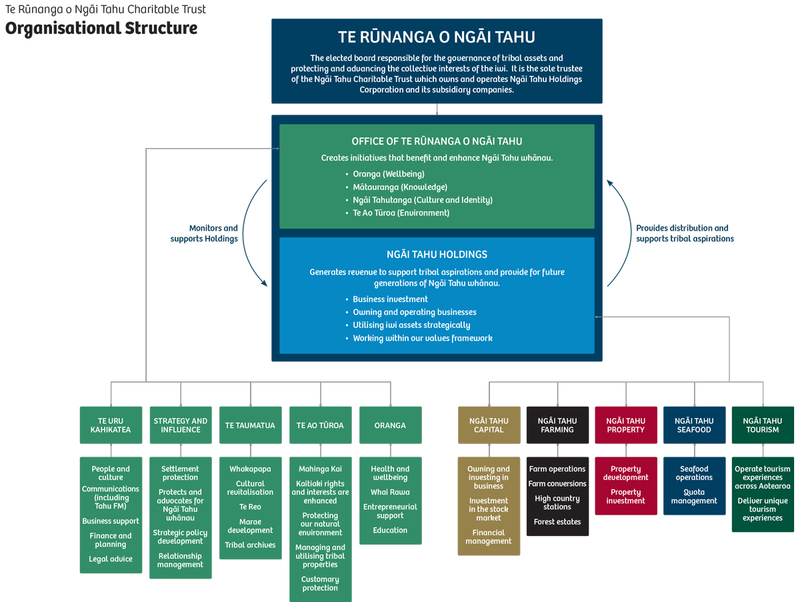 As such, the executive functions of Te Rūnanga are carried out by the Office of Te Rūnanga which manages the representational activities, protects the rights of Ngāi Tahu Whānui and delivers social and cultural programmes. Ngāi Tahu Holdings Corporation manages commercial activities and assets. Te Rūnanga has an intergenerational investment framework designed to ensure a steady and sustainable cashflow based on profit and capital growth matching its intergenerational tribal development strategy. It includes stringent benchmarking, spending rules as well as a strategic asset allocation framework. Annually Te Rūnanga issues Letters of Expectation to the Office of Te Rūnanga, Ngāi Tahu Holding Corporation and Whai Rawa which set out general and specific expectations regarding activities and performance. In response these business units develop detailed Statements of Corporate Intent setting out how they will fulfil those expectations. The development strategy of Te Rūnanga is aligned to a tribal distribution strategy. This sets in place an overall strategy for the tribe’s investment future, commercially as well as in our people and tribal development. Ultimately Ngāi Tahu invest to create the future we want for our tamariki (children) and mokopuna (grandchildren).